Dennis Ortiguera is of counsel to Lubiner, Schmidt & Palumbo, LLC and heads its immigration practice. Mr. Ortiguera's practice is limited to U.S. Immigration and Nationality Law with emphasis on employment, investment, waivers and family-based matters. Over the past twenty years, Mr. Ortiguera has overseen thousands of cases and counseled clients ranging from start-ups to large corporations in a wide variety of industries including banking, construction, consulting, engineering, finance, health care, information technology, and pharmaceuticals. Mr. Ortiguera is a member of the New Jersey Chapter of the American Immigration Lawyers Association (AILA). He has been named Ten Best Immigration Attorneys in New Jersey for 2017 and 2018 by The American Institute of Legal Counsel and as Top 100 Lawyers by The National Advocates in 2017 . Mr. Ortiguera has been a frequent lecturer on Immigration Law to the Trade and Investment Institute, was a Subject Matter Expert used by the New Jersey Department of Banking and Insurance, and a resource person for various organizations. Mr. Ortiguera is admitted to the New York State Bar, US District Court for the Eastern and Southern Districts of New York and is authorized to practice U.S. Immigration and Nationality Law throughout the United States. Mr. Ortiguera graduated from the Ateneo de Manila University and obtained his Masters of Law degree from Fordham University in New York. 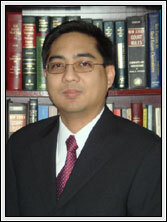 Mr. Ortiguera emigrated from the Philippines in 2000 after practicing law there for 6 years. As an immigrant, Mr. Ortiguera experienced the difficulties faced by immigrants and brings that understanding to his work with clients.